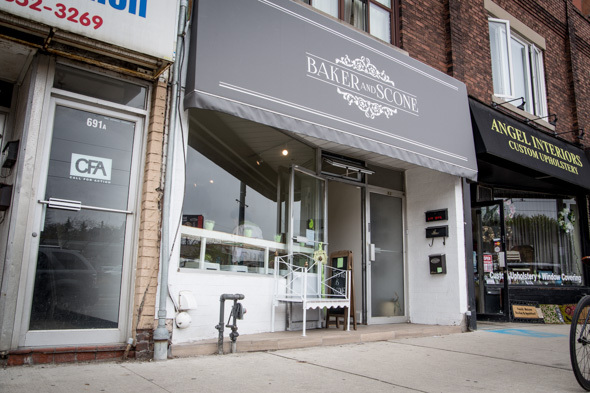 Baker and Scone is one of the newest faces on St. Clair Ave. 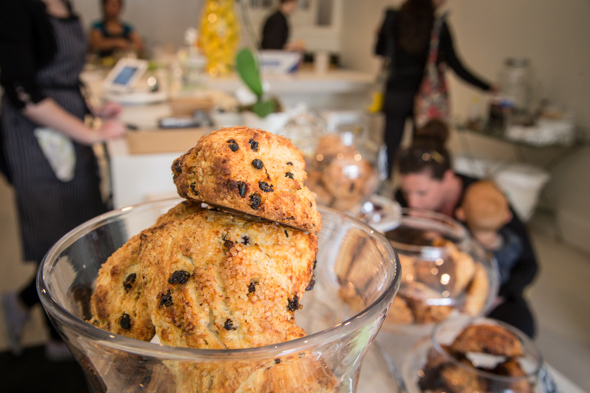 Owner Sandra Katsiou brings her love of scones to the new bakery, specializing in that quick bread so central to the British cream tea. 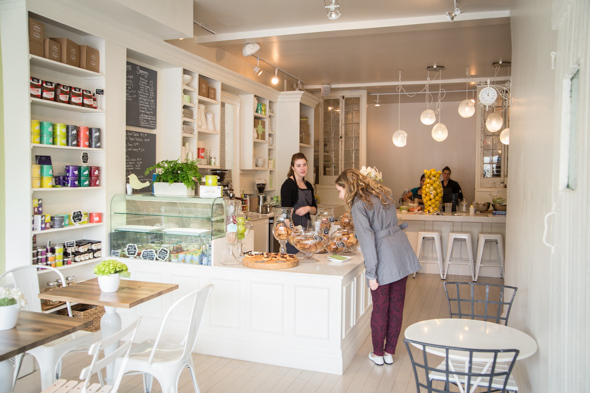 The space itself has a British vibe, but not in a stodgy way - it's more upbeat and bright, a little more Martha Stewart, with pistachio green walls and white countertops and cafe tables. 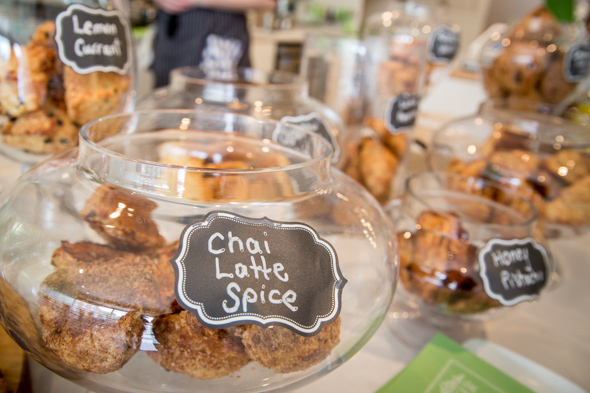 Baking happens toward the back, in a semi-open area that allows customers to watch the magic, which helps for when the shop acts as a venue for baking classes. 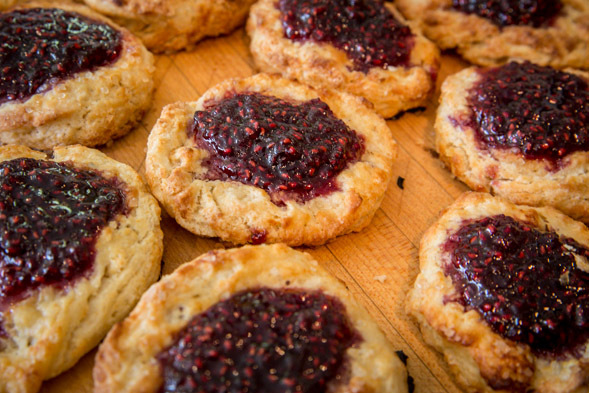 Scones sit under glass domes on the countertop. What is baked every day is anyone's guess - the list of flavours is long (upwards of 40!) and includes both sweet and savoury options, but if you call a day or so in advance you can order whatever type you like - half a dozen is $16, while a dozen is $31. The day I arrive they have brown sugar oatmeal, lemon currant, blueberry vanilla, orange date cardamom, and cheddar chive dill, among others. They even have a few gluten-free options. Plain scones, halved and coated generously with lemon curd, look as delicious as they taste. The dough is light and fluffy, leavened with the essential baking powder. I opt to taste-test the orange date cardamom and the cheddar chive dill. Both are beautifully soft and buttery. The savoury one is studded with finely chopped herbs and crusted with a few salt kernels on top; the sweet one, perfumed with orange and cardamom and full of chopped bits of tender medjool dates. 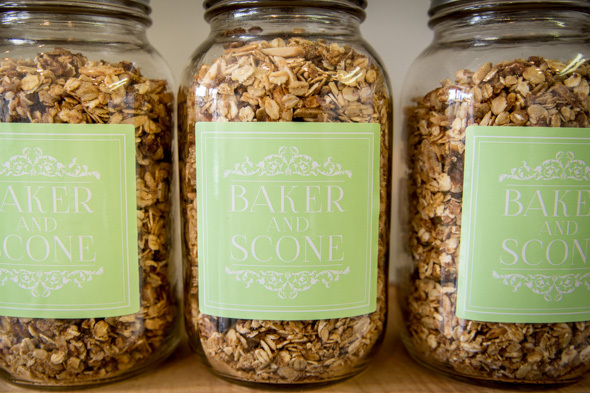 And while the scones are the feature, they also make cookies ($1.95), mini cupcakes ($2.25), and jars of granola ($8.99). You can also buy products to build your own cream tea: Greaves jams (mini ones for $2.75), Arvindras spices ($5.99), Ruffino Espresso beans and a wide selection of LĂ¸v organic teas ($17-19 per tin). Or, stay for lunch - they've got a homemade soup every day. 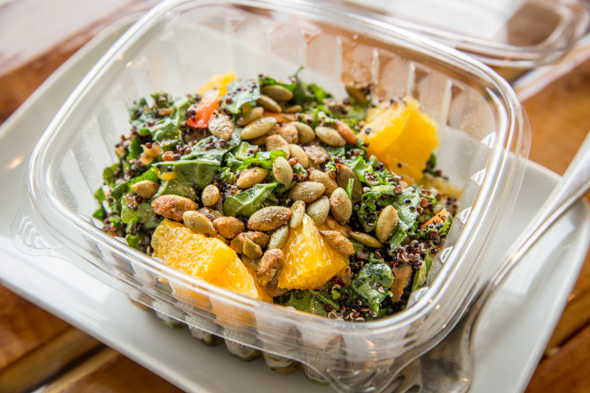 When I visited, the daily special was tomato fennel soup ($5.25 by itself, $7.65 with a scone); also available were Greek yogurt parfaits ($4.50) and a couple of boxed salads. My only lament was the absence of clotted cream to go along with Katsiou's lovely scones. True clotted cream (double Devon cream isn't even close) is thick and rich and creamy - and with jam on a scone, it's an otherworldly treat. If Katsiou could figure out how to get real clotted cream for those wonderful scones of hers, I bet she'd make a fortune.